Products of the domain : Trapet. Former domain of the Dukes of Burgundy, it has always been renowned for the extreme quality of its terroir. Five generations have succeeded to maintain the Trapet tradition traditionally certified in Bio-Dynamie. It is a set of terroirs patiently Assembled from generation to generation and now composed of the most renowned appellations such as: Chambertin, Latricières-Chambertin, Chapelle-Chambertin, Clos-Prieur and Petite-Chappelle, Gevrey-Chambertin and Marsannay. A mosaic of terroirs patiently assembled from father to son since 1897. The wife of the current owner, Andrée Trapet is Alsatian. Since 2002, she has taken over the estate of her parents, and watches over the vineyards passing tirelessly from Gevrey to Alsace. A domain of true passionate whose reputation is more to do! 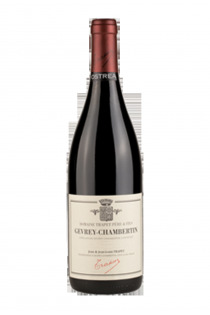 Gevrey Chambertin Ostréa - 2014 - Trapet.